For photographs of wedding rings, I have a method that's a little different from most. 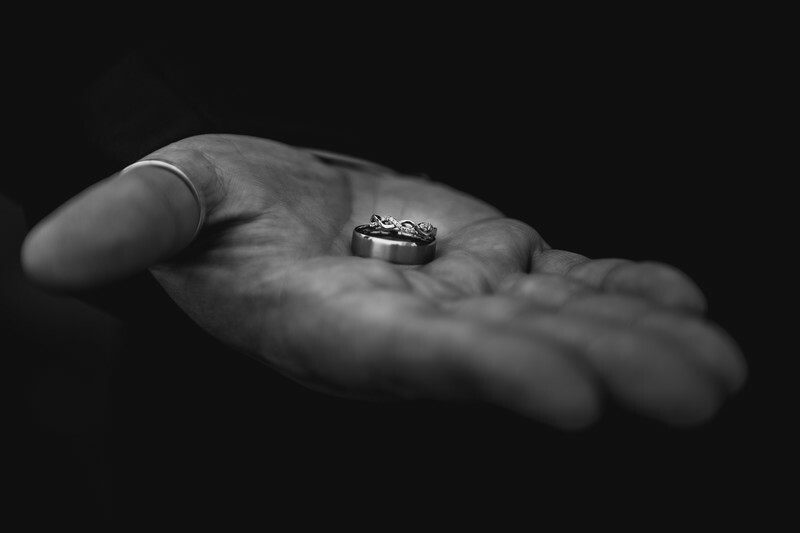 It's usually the duty of the best man to look after the rings on the morning of the wedding, and to show the connection between the best man and the rings, I usually choose to photograph the rings, where possible, in the hand of the best man. Sure, you're not likely to be able to identify the person in this photo just from their hand alone, but it's still a nice touch to show a human side in these images. For this photo, the set up was very simple indeed - the best man was wearing a dark suit, and I asked him to hold his hand out 'as if he were feeding a zebra' which always gets a laugh. I placed the groom's ring on the bottom, with the bride's ring resting on top in such a way that it points into the camera. The best man's hand was in more light than was falling on the front of his suit, meaning that with the correct exposure, the suit appears completely black which makes the hand look like it's floating! The light perfectly picks out the rings on the best man's hand too, making them really stand out.